IronPigs pitching kept the Pawtucket bats largely silent, limiting the lineup to only two hits. Brock Holt was the only player to reach second base, as the shortstop walked and stole second in the first inning and doubled in the fourth. Garin Cecchini was the only other member of the team to reach, going 1 for 3 with a walk. 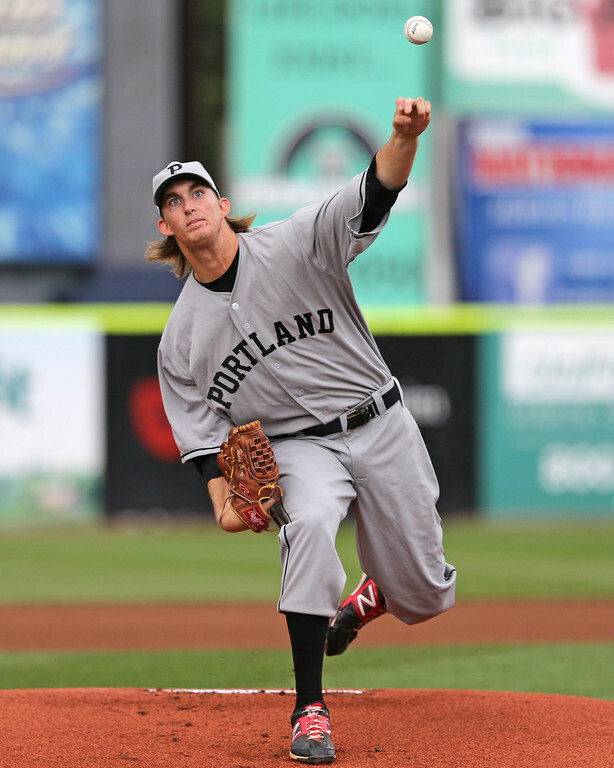 Portland's season opened in grand fashion, as 2013 SoxProspects Pitcher of the Year Henry Owens fired an Opening Day no-hitter in a 5-0 six-inning win over the Reading Fightin' Phils (PHI). Owens, who had a streak of 19 1/3 hitless innings with Salem last season, continues to stymie minor league hitters. In his six frames, the 6-foot-7 lefty struck out nine of the 20 batters he faced while walking only two, and did not let a ball out of the infield. Owens got plenty of help from the Sea Dogs offense, led by his 2013 Player of the Year counterpart Mookie Betts. Betts, making his Double-A debut, led off the game with a home run and finished the night 4 for 4 with three runs scored. Deven Marrero also came up big, going 2 for 4 with two doubles, both of which plated Betts. Blake Swihart was 2 for 3 with a triple and an RBI, and Henry Ramos also drove in a run as part of his 2 for 3 night. The game was called during the top of the seventh inning due to rain. The Salem lineup walked 13 times and its pitchers struck out 12 in a 10-3 victory over the Myrtle Beach Pelicans (TEX). Brian Johnson turned in a solid performance to earn the win against a strong Myrtle Beach lineup, allowing two runs (one earned) on four hits in five innings. He struck out seven while walking two, and at one point retired eight consecutive Pelicans,. He got help in the bullpen from Kyle Martin, who struck out four while allowing one run in three innings, and Kyle Stroup, who tossed a perfect ninth. The offensive outburst was highlighted by a third-inning grand slam by Ryan Dent. In all, Dent was 2 for 5 with five runs driven in. Jonathan Roof, David Chester and Carson Blair each walked three times for Salem. Roof added a double and a three runs scored, while Blair delivered an RBI-triple . Greenville defeated the Kannapolis Intimidators (CWS) 3-1 to round out the day. Left-hander Cody Kukuk was given the Opening Day assignment, and he continues to be tough to hit when throwing strikes. Kukuk allowed one run on three hits in five innings, striking out four but walking four as well. The only run he allowed came on an RBI double by old friend Cleuluis Rondon. Kukuk was followed by an excellent performance by Jacob Dahlstrand, who retired all nine batters he faced, seven by way of the ground ball. Joe Gunkel gave up one hit in a scoreless ninth inning to pick up the save. Kannapolis pitching could not retire shortstop Tzu-Wei Lin, who went 3 for 3 with a walk in his South Atlantic League debut. Tim Roberson went 2 for 4 with a pair of RBI, while Jordan Weems was 1 for 3 with a double and a walk. Player of the Day: While stellar performances from Mookie Betts and Tzu-Wei Lin deserve mention, the clear choice is Henry Owens, who channeled Bob Feller by delivering an Opening Day no-hitter. It was the second no-hitter that the lanky left-hander has been a part of, as he also struck out 10 in a combined effort last July 17. Reading batters were punchless on Thursday night, striking out nine times without getting the ball out of the infield.